Professor Lane Shefter Bishop’s new film, Wicked Moms Club, had gone through a wild ride but came to be a success story. Aside from being a professor, Bishop has the talent of being a working producer and director in Hollywood. MarVista Entertainment, the company that produced the film, called Bishop saying that they needed a director on a film that was just green-lit for production. Luckily, she was available for the movie that would soon to be Lifetime’s new film, Wicked Moms Club. The inspiration behind the story was based on an article that captured the attention of MarVista’s development executive. “She [the executive] was telling me about the article the project was based on and I said ‘I’ve read that article!’” chuckled Bishop. The article told the story of a teacher and mom who was being bullied and harassed by the mother (and father) of a student she had in her class. The film tells the tale of a mom who comes into school with her daughter late in the school year and is initially taken under the wing of the head of the PTA. “Basically, wicked moms–moms who do bad stuff,” clarified Bishop. Before beginning filming, Bishop got the chance to look at the developing script. “I knew it needed work, structurally, because act three was really short. But I liked the unique topic of mom-bullying, like Mean Girls grown up,” Bishop said. “Normally you have a month of prep, but this was like two weeks; it was crazy. We did our read-through, which is when the crew reads through the script and talks about any problems, only two days before the shoot started,” Bishop explained. She has been a director for 25 years and considers this project to be one of the craziest, toughest, shoots she’d ever been on. But despite this, Bishop kept her attitude absolutely positive. 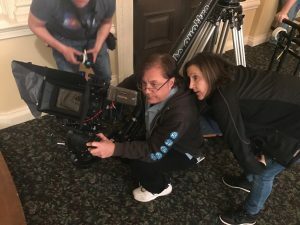 During the frosty month of March, she was working hard directing and shooting for only fifteen days in 17-degree weather in Lexington, Kentucky. “The actresses were phenomenal and we eventually had a good crew, but I mean that’s the really important part. If you have a really good cast and crew, you’re always going to do well,” Bishop said. From producing The Duff to finishing directing her new film, Wicked Moms Club, professor Bishop still has her hands full. Her upcoming schedule is filled with finishing post-production on her newest movie as well as developing two more films that she’s going to both produce and direct. She looks at her producing and directing work as a benefit for her production class, Comm 448/449. “It’s good because I can then bring in audition tapes, dailies, and even cut sequences to our production class to show students how it’s done in the real world,” shared Bishop. Just like Bishop saw the movie from a Mean Girls point of view, so did Lifetime. The trailer portrayed how the film was all about Mean Girls grown up and doing bad things. The movie premiered on Lifetime, Saturday, October 7.